I, like most everyone else, is growing weary of "Royal Wedding" coverage. Basically, I am weary because there is just nothing to report, so one finds oneself watching news reporters interviewing each other. I find it highly improbable that Sarah Burton is going to push past Anderson Cooper and Meridith Vieira at the bar at The Claridge and tell the bartender that she needs a pint to celebrate because she just finished the final alterations on Kate Middleton's gown. It is not going to happen. I want to see the dress when she exits the Rolls and I want everyone to leave it alone until 6 a.m.!! 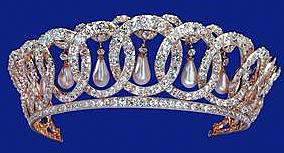 Still, the wedding allows one (me specifically) to discuss one of my favorite things -- tiaras. And spending most of my time in West Virginia digging in the garden in my uniform of tattered men's shirts and a baseball cap, I for one am thrilled. This week a gambler placed a 6,000 pound bet at 12-1 odds that Kate will wear the tiara that Queen Elizabeth wore at her wedding. This is thought to be the largest gamble made on the wedding so far and the gambler stands to win 72,000 pounds. Ladbrokes, who took the bet, has stopped taking bets on Middleton’s head piece. The tiara in question is the George III Tiara. 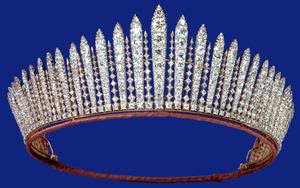 (It is sometimes known as the Russian Fringe Tiara not to be confused with the Kokoshnik Tiara which is also sometimes known as the Russian Fringe Tiara.) The diamond fringe tiara forms a gradual circle of vertical rows of diamonds. It looks a bit like an inverted necklace because in 1830 it was a necklace made of brilliant cut stones that belonged to King George III. 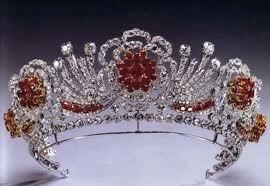 It was made into a tiara and was worn to the opera in 1839 by Queen Victoria. It was inherited by Queen Mary when she became Queen Consort in 1910, and she in turn gave it to her daughter in law, Queen Elizabeth in 1937 (not to be confused with Queen Elizabeth II, we will get to that later). 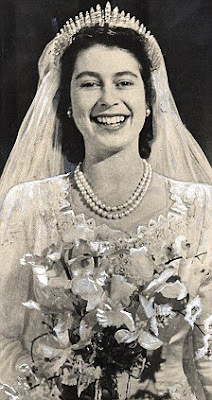 The Queen Mother (Elizabeth) loaned it to her daughter Princess Elizabeth (now Queen Elizabeth II) as “something borrowed” for her wedding in 1947. She (The Queen Mother (Elizabeth)) loaned it again to her granddaughter (Princess Anne) in 1973 for her marriage to Captain Mark Phillips. Here are just a few tiara's from the Queen's closet. Seriously, she has more tiara's than Miss Alabama and Miss Mississippi combined! I am sooooo jealous. In 1913, Queen Mary commissioned the Crown Jewelers Messrs. Garrard & Co. to construct a tiara based on the design of the Cambridge Lovers Knot Tiara, that was once owned by her maternal grandmother Princess Augusta of Hesse-Cassel, the Duchess of Cambridge. 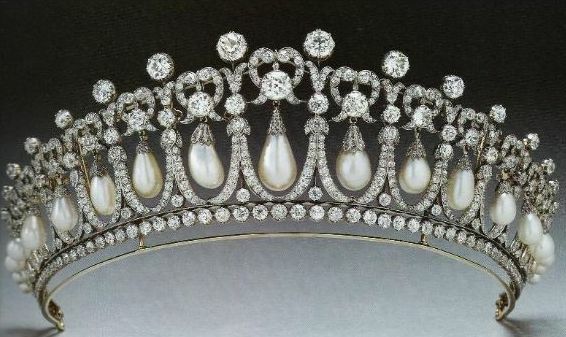 This new lovers knot tiara, also came to be known as the Cambridge Lovers Knot Tiara, because of the resemblance of its design to the original Cambridge Lovers Knot Tiara, and consisted of 19 arches, and 38 drop-shaped pearls, 19 hanging as pendants and 19 rising up as spikes. The 19 pearls that rose up as spikes could also be dismantled. The Oriental-Circlet-Tiara with rubies and diamonds. 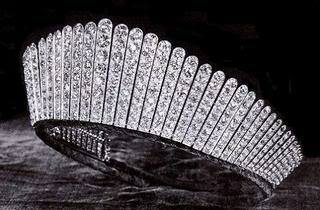 This also called Indian-Ruby-Tiara was one of the favorite tiaras of the late Queen Elizabeth the Queen Mother. 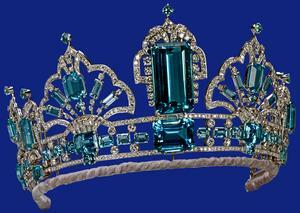 This tiara was made for the Grand Duchess Vladimir, the aunt of Tsar Nicholas II. Smuggled out of Russia during the Revolution by a British diplomat, it was sold to Queen Mary in 1921. 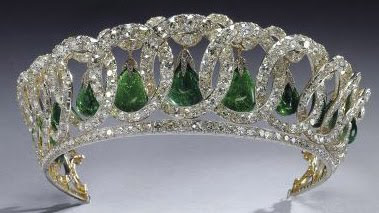 She adapted the tiara to take fifteen of the celebrated Cambridge emeralds as an alternative to the original pearls. The tiara was inherited by The Queen from her grandmother Queen Mary in 1953. Since this is my favorite or "favourite" and since it does not have a nifty name, I am henceforth calling it The Lucinda Tiara. Grab a nap this afternoon, 4 a. m. will be here before you know it! It's strange see a person with a tiara, don't you think. What you have identified as the Oriental Circlet Tiara is actually the famous 'Burmese Ruby Tiara', ordered by Queen Elizabeth as a beautiful setting for the 96 rubies which were a gift from the Burmese people. The Queen received these rubies from the people of Burma as a Coronation gift. After 26 years, she finally sent the rubies to Garrard’s to create a new tiara in 1973. She selected a design where the rubies were arranged in clusters to look like the Rose of England, surrounded by diamonds. I forgot to mention that I can get you any number of photos of the Oriental Circlet Tiara that you wish. Let me know. This one is showing up on Pinterest misidentified, and some other Pinners and I like to try and keep things accurate if we can. Lots of folks use Pinterest as a learning tool and resource, and it wouldn't do any good to furnish the wrong information, even accidentally.